International Conference, FoVeOOS 2011, Turin, Italy, October 5-7, 2011. 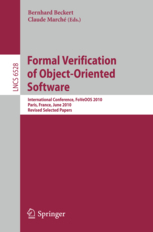 9th International Symposium on Formal Methods for Components and Objects, FMCO 2010 – "State-of-the-Art Survey"
International Conference, FoVeOOS 2010, Paris, France, June 28-30, 2010. Note: My PhD thesis was originally written in English (completed in 1998) but its German translation is the official version submitted to the university. If you are interested in Chapter 5 on deterministic proof procedures, you should better read my paper that was published in 2003 in the Journal of Symbolic Computation (PDF). Editors: Wolfgang Bibel and Peter H. Schmitt. An extended version of this paper including proofs is available as technical report. University of Karlsruhe, Department of Computer Science, TR 11/97. University of Karlsruhe, Department of Computer Science, TR 41/96. leanEA: A Poor Man's Evolving Algebra Compiler Bernhard Beckert & Joachim Posegga Logik in der Informatik - 3. Jahrestagung der GI-Fachgruppe 0.1.6, Karlsruhe. Tableaubasiertes prädikatenlogisches Beweisen mit Mixed integer programming Bernhard Beckert, Reiner Hähnle, Klaus Ries, & Peter H. Schmitt Beiträge zum DFG-Kolloquium im Rahmen des Schwerpunktprogramms "Deduktion". Ein vervollständigungsbasiertes Verfahren zur Behandlung von Gleichheit im Tableaukalkül mit freien Variablen Bernhard Beckert Diplomarbeit, Fakultät für Informatik, Universität Karlsruhe.